Catherine O’Reilly, associate professor in the Department of Geography-Geology, is part of a global scientific effort to help people living around Lake Tanganyika in East Africa. O’Reilly has been studying the lake with local Tanzanian scientists and GLEON (Global Lake Ecological Observatory Network) for the past 15 years. Studies from the research have shown an increase in the water temperature of the 10-million-year-old tropical lake over the last century. “The warming is causing changes in the lake’s ecosystem that are threatening the fish species the local people depend on for food as well as their livelihood,” said O’Reilly. The team will put high-frequency, buoy-based sensors in the lake to monitor the temperature and the conditions of the lake. The information is then shared with lake authorities about how to better manage the lake and make fishing more effective. “When local fishermen know the lake conditions, they can catch more fish and they understand it would be a better economic decision to fish at certain times,” said O’Reilly. 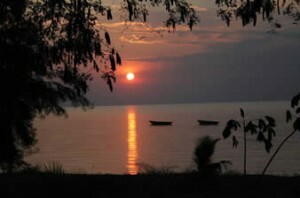 She will continue taking water samples and doing analysis of Lake Tanganyika as part of a team that has recently been awarded $2 million through a Danish government grant.